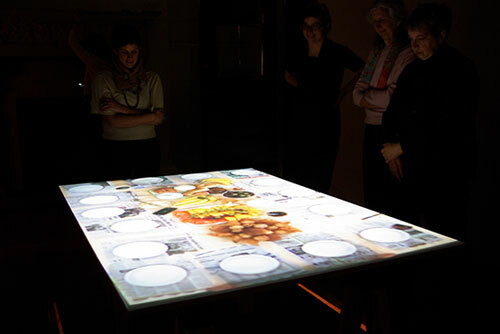 SP Potluck Project, 2009. approx 20 minute video projected onto a tabletop; and related 80 page index-book of video stills. SP Potluck Project is a working laboratory for video collaboration between four artists: Natalie Campbell, Carissa Carman, Heidi Neilson, and Liz Zanis. 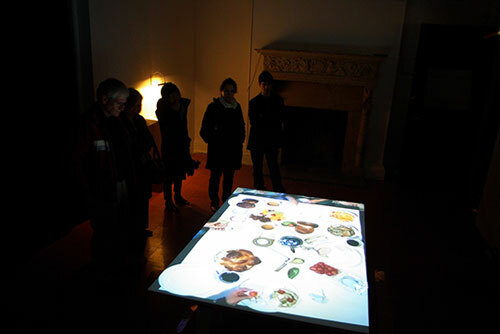 The work produced is exhibited as part of OUT OF THE INCUBATOR: Collaborations, curated by Ann Kalmbach and Tatana Kellner, at the Islip Art Museum February 11 – April 19, 2009. Much of the project’s production occured during a Lower Manhattan Cultual Council Swing Space residency, December 2008 – January 2009. SP Potluck is a video installation which investigates similarities between artistic collaboration and other shared creative processes that arise while cooking, eating, and working together. Potluck meals and related collaborative table-top activities were recorded on video from an overhead angle, from setup to cleanup. 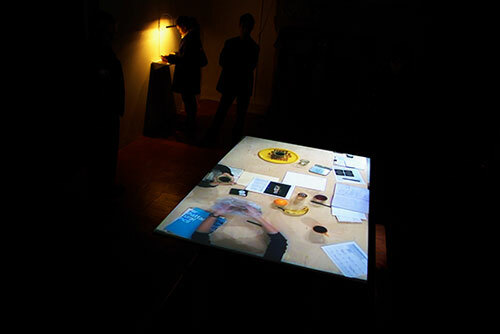 The resulting edited video is projected on the table surface, sized to the camera’s field of view, inviting viewers to engage with traces of past action and reflect on the nature of collaborative activity. Visit the project blog, with timelapse video of the filmed events and other documents.